How to keep your blinds clean. 1. Vacuum blinds often with the brush attachment. Vacuum across the slats, not up and down. 2. Use a lamb's-wool duster, again working across the slats and starting at the top. Do not use plastic dusters. 3. When dusting or vacuuming vertical blinds, brush downward only, as the slats often become unhooked if you brush upward. 4. 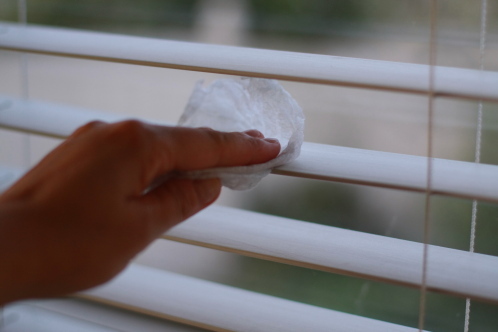 Use a rubber sponge, also known as a dry sponge (found at hardware and paint stores), to remove dust and residue from both fabric and vinyl blinds. Simply wipe the dry sponge firmly across the blinds. 5. For spot cleaning, spray an all-purpose cleaner onto a clean dry cloth and wipe the soiled area of the blind. Never spray the cleaner directly onto the blind. 6. You can wet wooden blinds when cleaning, but don't soak them. Clean them in place instead of removing them as you would for other types of blinds. 7. If fabric blinds become very dirty, take them to a dry cleaner. 8. Do not try cleaning blinds by spraying them with a car-wash hose, dunking them in the tub or one slat at a time. 9. To clean metal and vinyl blinds, follow this method: Take the blinds outside to your patio or driveway and lay them on a small rug or piece of carpet. Put a few drops of dishwashing soap in a bucket of water. Wet a car-washing brush and brush the blinds from side to side, and then turn them over and brush the other side. Rinse the blinds gently with a garden hose while tilting them so that the water runs off. To prevent water spots from forming, quickly run your finger down the slats a couple of times to remove excess water. When done, drape the blinds over a fence or a couch to dry.